Sure, it's easier to rip open a bag of store-bought potato chips, but homemade potato chips aren't just crazy delicious, they're fun to make. Part of the fun of homemade potato chips is you can use whatever variety you like: Yukon Golds, Yellow Finns, Russian Red Fingerling, even purple or blue potatoes. Plain Jane Russets are, of course, also an excellent choice. Plus, you can salt them to taste, and even add black pepper and other spices. Follow these steps to make delicious, addictive potato chips right at home with a minimum of fuss. Looking for a bit of a twist on this classic treat? Check out Beet Chips, Sweet Potato Chips, or even Kale Chips. The choice is yours: Scrub the potatoes clean or peel them thoroughly. Leaving the skin on adds color and a faint bit of texture to the final chip. It all depends on how classic or rustic you like. 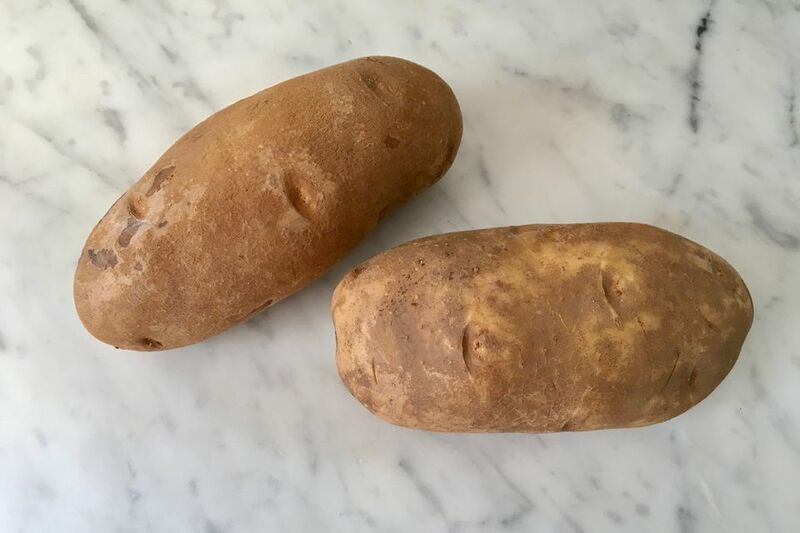 Once cleaned or peeled, slice the potatoes evenly and as thinly as you like. 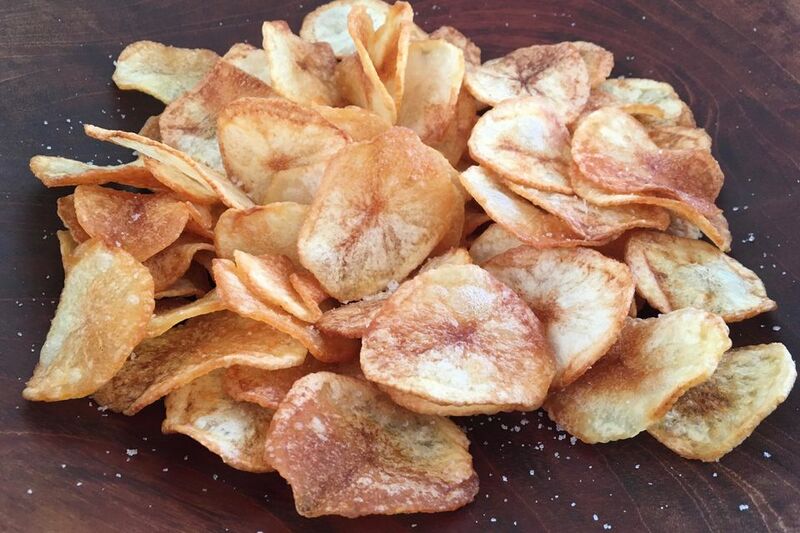 Thick-cut homemade potato chips are fabulous, so don't get too obsessed with thinness. Evenness - so the potato chips cook evenly once you put them in the oil - is the key here. Note: You can use a kitchen mandoline for this if you have one, but a sharp knife and steady, patient hand work just as well. Rinse the potato slices and then soak them for about half an hour in a large bowl of cold water. You may be tempted to skip this step; don't. Soaking the potato slices removes excess starch and is a key element to ensuring that the potato chips fry up crispy. Drain the potato slices and dry them thoroughly with a clean kitchen towel or layers of paper towels. Water will make the oil splatter, creating a mess and potentially causing burns. Dry potato slices will cook faster and more evenly, with less mess, so don't skip this step. In a large, heavy pan or pot (the high sides of a pot help keep the oil from splattering too much), heat about 1/2 inch of vegetable oil, canola oil, grapeseed oil, or lard to about 350 F.
If you don't have a candy or frying thermometer, don't worry. Just drop a (dried off!) slice of potato in the oil, if it sizzles immediately but gently, the oil is the right temperature. If it doesn't sizzle or sizzles slowly, the oil is too cold; if it sizzles violently, the oil is too hot. Add a single layer of potato slices to the oil. Fry the potato slices until they are golden or brown, as you like, on both sides, about 3 minutes per batch. Use a slotted spoon or tongs to transfer the potato chips either to layers of paper towels or to a cooling rack set over a baking sheet to drain. Sprinkle the chips with salt or other seasonings, if you like. Note that while a potato chip fresh from the pot sounds fabulous, potato chips crisp up as they cool, so "fresh" ones won't be crispy and will likely disappoint. Be sure to let them cool completely to room temperature before eating. Repeat frying the chips in batches until all the potato slices are cooked. Serve the potato chips the same day they are made for the absolute best result and to benefit from having gone to the trouble of making your own homemade potato chips. If you have extra chips or are working ahead for a party, know that you can store them in an air-tight container at room temperature for up to two days and maintain almost all of their divine crispiness.